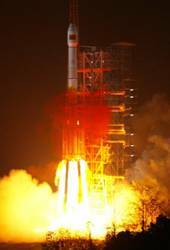 China launched its 10th Compass/ BeiDou-2 GNSS satellite this morning (December 2, 2011). This is the third Compass satellite launched this year and the fifth placed into an inclined geosynchronous orbit. According to Xinhua, China’s official news source, the spacecraft went up on a Long March 3A launcher at 5:07 A.M. local time from Xichang launch center in Sichuan province. China is fast-tracking its own GNSS, which will ultimately consist of 35 satellites. At a recent industry forum in Beijing addressing strategic development of BeiDou, government experts said that, if all goes as planned, 16 satellites would comprise the Compass constellation by the end of 2012. Officials with the China Civil Aviation Authority announced this year that civil aircraft currently using the U.S. GPS system will gradually convert to use of Compass. The last successful launch for Compass was on July 26, 2011.